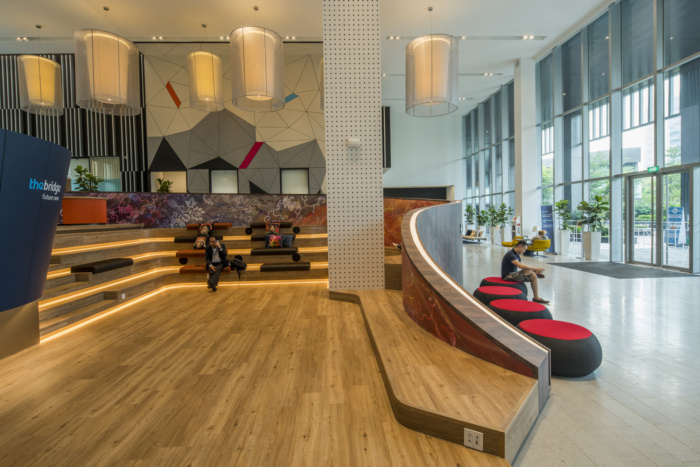 Space Matrix, an office design company, was engaged by Asia’s largest business space planner, Ascendas-Singbridge, to design their offices located in Singapore. Traditional office designs are often rigid and segmented, leading to uninspiring work conditions, and thus, a lack of efficiency and output. Whereas, modern work cultures are built on improvisation and collaboration. To reflect this, workspace designs have to be agile, flexible and inclusive. To better cater for modern work culture, Ascendas-Singbridge, has formulated a new community workplace: thebridge. Located on Science Park Drive, the space connects a powerful network of science, tech and business communities. The idea for thebridge is to promote a culture of work communities. Such workplaces also reduce the carbon footprint, energy consumption and monotony associated with isolated physical workspaces. Work communities may comprise varying number of people, working on diverse projects with different objectives. Office spaces must be flexible enough to adapt to these different situations – an enabler instead of an enforcer of work patterns. To help make the thebridge a reality, Ascendas-Singbridge enlisted the workplace design services of Space Matrix. Here, we take a look at the specific strategies that Space Matrix employed to bring the community workplace concept to life. The entrance lobby does more than just welcome patrons. Flanked by large, interactive media screens, a patron is inspired to explore. Agile workspaces, entwined with recreational zones, promote a culture of interaction and collaboration in a relaxed, informal setting. These include standing workstations, informal amphitheaters and seating areas, as well as a variety of themed breakout zones. The meeting rooms are all designed to a choice of themes that reflect local culture and work patterns. These help to create a unique and inspiring ambience, making work enjoyable. The event spaces and convention centers within thebridge are fitted with elegant concertina screens. Besides serving as a fine architectural ornament, these screens are movable and find use as partition walls. The allocation of individual suites to tenants leads to wastage of space. Instead, fully equipped work-desks within a collaborative space will facilitate maximum space utilization. The abundance of space thus freed up can be put to use as breakout zones, recreational spaces, and utility areas. Thus, within the tenancy model, a patron will pay only for his immediate work premises, but have access to a host of other services by extension, greatly improving work-life quality. The space savings made using this model are exemplary. The normal square footage accorded to a patron in an average company is about 40 sq.ft but thebridge nearly doubles that statistic, with a minimum of 70 sq.ft available to every patron. This gives rise to a healthier and more sustainable work model. By enabling a culture of work communities, thebridge paves the way for an office space typology that is effective, sustainable and future-oriented at its core.